with a declaration of Russian citizenship for the Lower Qaraqalpaqs. Qaraqalpaq history is a contentious subject. The formation of the Soviet Socialist Republics along ethnic lines in 1924 and 1925 inevitably led to a drive to construct a history for each of the newly formed ethnic groups, applying the new Marxist pseudo-science of ethnogenesis. Roughly summarized, this "history" traces the origin of the Qaraqalpaqs back to the cattle-breeding Apasiak marsh dwellers, part of the Saka-Massagetae, who occupied the shores of the Aral Sea in the early part of the 1st millennium BC. Following centuries of intermixing with immigrant Huns and Turks from the east they emerged as the Pechenegs in the 7th century, still breeding cattle in the Aral marshes. Many were forced westwards by the arrival of the Oghuz, but others – the eastern Pechenegs – remained in the Aral region. It was they who would eventually form the basis of the new Qaraqalpaq nation. Some were pushed into the Ukraine following the arrival of the Qipchaqs in the 11th century, while others fled west as a result of the Mongol invasion of Khorezm in 1221. The Qaraqalpaq confederation was supposedly completed within the eastern part of the Noghay Horde during the 15th century, in the region of the Crimea. The Qaraqalpaqs began to return eastwards in the mid-16th century following the Noghay civil war, first to the Syr Darya and later into the Amu Darya delta - their original "motherland". In essence this remains the official history of the Qaraqalpaqs today, expounded by local ethnographers and taught in schools and colleges. Yet crucial parts of this history are fatally flawed or have no archaeological or historical foundation. The link with the Crimea is based solely on tribal legends, which might have been introduced following the initial formation of the Qaraqalpaqs by small groups of immigrant Noghay. This is not history but wishful thinking, constructed to legitimize Qaraqalpaq beliefs in an ancient origin within their present homeland - beliefs that have become even more important following Uzbek independence. In reality, the original Saka population of the Aral region was transformed beyond recognition by waves of foreign immigrants: Sarmatians from the trans-Urals, Huns from the Altai, and the first Turks in the 6th and 7th centuries AD. It was the Oghuz, not the Pechenegs, who settled in the Aral region. The Pechenegs came from the middle Syr Darya and, although they were displaced westwards by the Oghuz in the 9th century, they moved swiftly through the Aral region towards the lower Volga and beyond. Some were absorbed within the unique Kerder culture of the Amu Darya delta, but were dispersed following the eventual drying-out of the Kerder oasis. The arrival of Qipchaq immigrants from Siberia caused a further wave of westward migration. Many Qipchaqs settled but others continued migrating into southern Russia, the Ukraine and even Hungary. The Chernye Klobuki or Black Hats who were recruited as frontier guards by the Kievan Rus from itinerant Pechenegs, Oghuz and many other tribes are often mistakenly cited as the ancestors of the Qaraqalpaqs, despite the fact that many became settled agriculturalists and adopted Christianity. At the time of the Mongol invasion, all of the nomads throughout Khorezm were referred to as Qipchaqs despite their multi-ethnic origins. Although Khorezm was temporarily devastated, it was quickly rebuilt into a thriving Golden Horde trading centre. 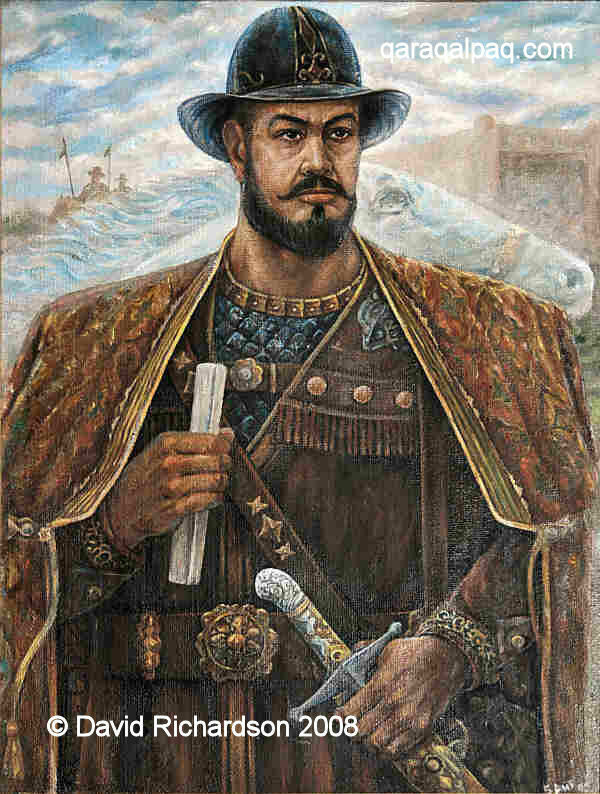 It was Timur, not Chinggis Khan, who destroyed Khorezm for good, demolishing its irrigation system and plunging the northern Amu Darya delta into a 200-year-long ecological crisis. Its nomadic population was forced to leave – not to the Ukraine but more locally to the Sarykamysh Lake and the lower Syr Darya. Timur's subsequent defeat of the Golden Horde in 1395 left a mêlée of different tribes and confederations between the Black Sea and the middle Syr Darya, including the Noghay Horde to the west and the Shaybani (Uzbek) Horde centred in south-western Siberia. During the 15th century many nomads began migrating eastwards into the Syr Darya valley. These were not Noghay from the Ukraine but nomads from Siberia, led by the early Uzbek Khan, Abu'l Khayr. Devastating attacks by Jungars, Uyghur tribes from the east, led to a tribal division along the Syr Darya in the 1460s and the emergence of separate Qazaq and Uzbek confederations. 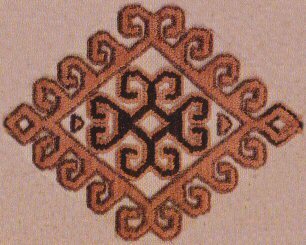 Until recently, the earliest historical mention of the Qaraqalpaqs was more than one century later - in 1598, at Sighnaq in the middle Syr Darya. Although the datings are still only tentative, some very recent and important archaeological excavations of early Qaraqalpaq burial sites suggest that the Qaraqalpaqs were not only at Sighnaq at this time but also at many downstream locations, stretching along the old Jan'a Darya channel as far as Barak Tam, which then lay close to the south-east corner of the Aral Sea, and the Qırantaw burial site not far from present-day No'kis in the Amu Darya delta. It seems that just like their Uzbek and Qazaq cousins, the Qaraqalpaqs formed their own separate tribal confederation across a large geographical area. By the early 17th century the Qaraqalpaqs were stretched across a vast tract ranging from the lower reaches of the river Emba in the northern Caspian, to the Turgay river to the north of the Aral Sea, to the lower and middle Syr Darya in the east and to the Amu Darya delta in the south. From this we infer that the probable date of their initial formation was at some time in the early 16th century. The Amu Darya changed its direction again in the last quarter of the 16th century, flowing northwards back into the Aral Sea and creating an island of virgin marshlands known as Aral. Nomadic Qongrat and Mang'ıt Uzbeks were the first to enter this empty region in 1620. The majority of Qaraqalpaqs remained settled along the upper Jan'a Darya and the Syr Darya until the 1720s when they and their Qazaq neighbours came under further attack from the Jungars. Some Qaraqalpaqs fled into the Ferghana Valley but the majority moved downstream into the lower Jan'a Darya. Constant harassment by Qazaqs from the Lesser Horde eventually forced them into the "badlands" of the Amu Darya delta, where they lived and mixed with the Aral Uzbeks. They were finally subjugated and settled by the ruthless Khan of Khiva, Muhammad Rahim Khan, in 1812. The life of the Qaraqalpaqs during the 19th century was a tough one - living in yurts in the mosquito and disease-ridden lands of the delta; subject to the whims of the Amu Darya; building irrigation ditches by hand to water their crops; unfairly taxed by Khiva; their lives and livestock vulnerable to raids by local Yomut tribesmen during the bitter winters. The majority lived in abject poverty, only their tribal and religious leaders being wealthy enough to maintain a semblance of their traditional material culture. Their plight was not greatly alleviated by the Russian conquest in 1873, although the Russians did improve security and stimulated trade and agricultural growth. It was the Soviets who eliminated their corrupt leaders and radically improved their standard of living. Collectivization of the Qaraqalpaqs (but not the Turkmen) went relatively smoothly in Khorezm, removing the hated landlords and expanding the cultivation of cotton, or "white gold", a profitable crop that eventually gave Qaraqalpaqs their first taste of prosperity. This page was first published on 12 October 2008. It was last updated on 4 February 2012.